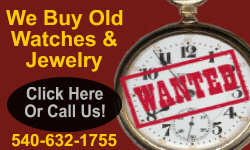 We Buy Old, Vintage, and Antique Pocket Watches & Wristwatches. If great grandpa or grandpa wore it - We want it! Some old watches can be valuable and we love them all! contact us if you have old watches or vintage mens Jewely for sale. Old paper items are highly collectible and very interesting to many collectors and non-collectors around the world. Some of the most overlooked valuable vintage and antique items are made of PAPER! 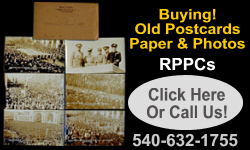 Old post cards, photos, billheads, advertisements, old mail, fishing licenses and more! 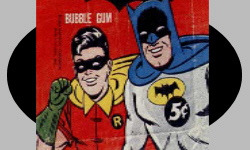 Do you have old vintage toys or vintage collectibles featuring characters and superheros? 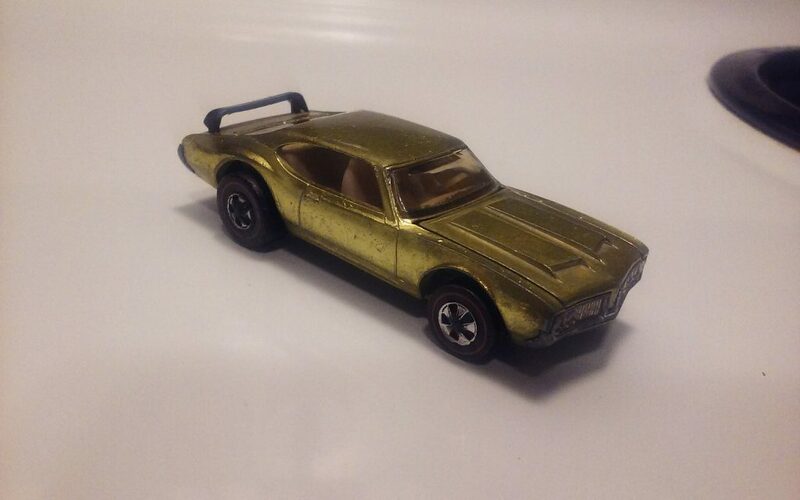 Old toys and vintage toys from the 70s, 80s, and older are a fast easy sell and can make you some quick cash. We want to buy your old toys and vintage collectibles related to TV Shows, Heros, Characters, and other! 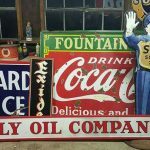 Here is a list of some (just a few) upcoming and booming vintage instagram accounts to follow if you are interested in vintage and antique related content. Follow these accounts and get active and engage! You will gain followers and be part of the “Vintage” Instagram Community. First and foremost please follow me on instagram @RoanokeCollector (J.W. Holcomb) and also our project @vtgbox! Top Picks: Some of the top picks are accounts I follow and like – I have hundreds I visit but these just stick out in my head. Further below you will fid more vintage accounts as well. If you have a favorite Vintage Related Account ADD IT to this list by leaving a comment! This is my account @RoanokeCollector – I feature vintage finds and other interesting items I encounter while being a land pirate. Includes oddities, vintage toys, jewelry, paper items, curiosities, collectibles, art, pin-ups, risque, tons of eclectic smalls and more. 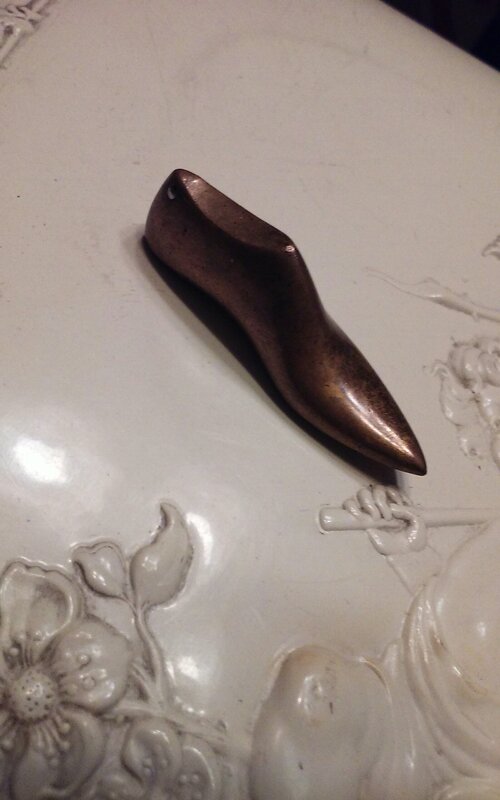 Follow @evintigue for vintage jewelry and other interesting post! Very nice stuff here! She sells online also so you will have a chance to buy items you see. Very active account and worth following! This guy @luckybuttonsjewelry is awesome and is a local sideshow performer and creator of all sorts of vintage style jewelry using mixed vintage material and (mostly) coins. He is entertaining and extremely creative. I met him at a local flea market in Roanoke VA years ago where he played a saw with a violin bow and made it sound great. Hey Mama! She’s got that Jewelry ya’ll! @estatejewelrymama has some amazing visuals on her instagram page/feed. you can buy her jewelry online also! She has over 30k followers and that alone tells you people like her style! Give her a follow. I love looking at her quality images and Jewelry! BLING! You might recognize this odd fellow! @Ryanmatthewcohn Ryan Matthew Cohn is the star of the show “Oddities and Curator at @Houseofwaxbar and @odditiesflemarket – His instagram is a daily visit for me – Although he doesn’t know it (by might know now) I am a big fan of his show/lifestyle/and items. I would love to own a signed bone or something from him (Hint Hint Matthew!!) – Give him a follow and check out all his creative projects and ventures! Great page/feed! 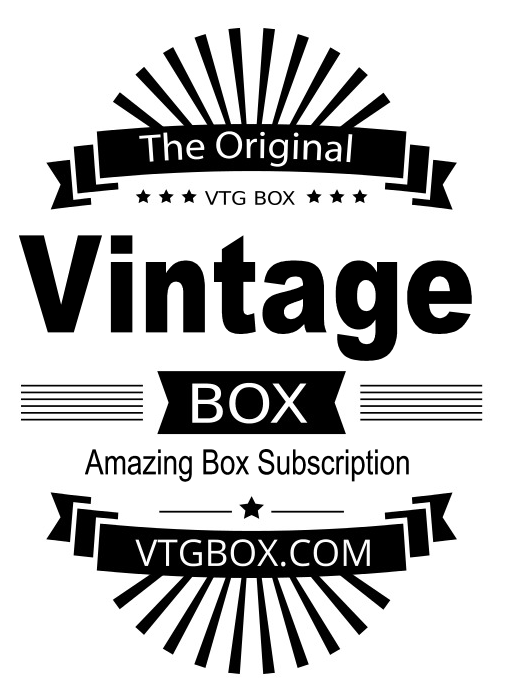 vtgbox – This is the instagram account for our project vtgbox/vtgbox.com – a monthly vintage subscription box service! We promote our service on this account and you will find all sorts of cool pictures and videos of vintage and antique items. Give us a follow @vtgbox! Do you like vintage and antique medical, apothecary, oddities, steampunk, skulls and more? Then you will want to check out @medicalandcollectables – They stay pretty active and find some pretty interesting stuff! The account is owned by Mycheal Gybbons. Danielle Colby “The Queen Of Rust” @danielleamericanpicker – You may know her as Danielle from the hit entertainment show American Pickers, Instagram followers know her as the half naked burlesque, risque, dancing, shaking, vintage gal. She shows all (almost) 0n her instagram page and has a lot of vintage related content! Check her out! She gets mixed reviews online for her open free-spirited content but she makes it look fun regardless. Go girl! I will be updating this list weekly with new interesting accounts. 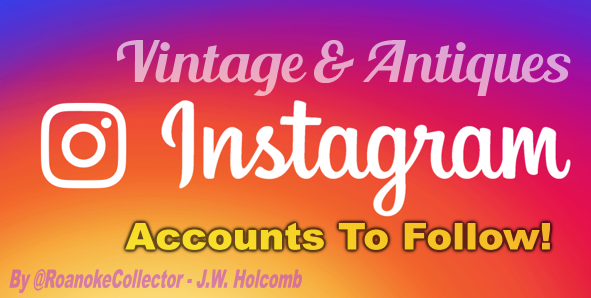 Some accounts will be newer and have lower followers than many established accounts, and that is the point of my list – it is to help you find new fresh vintage friends to follow. 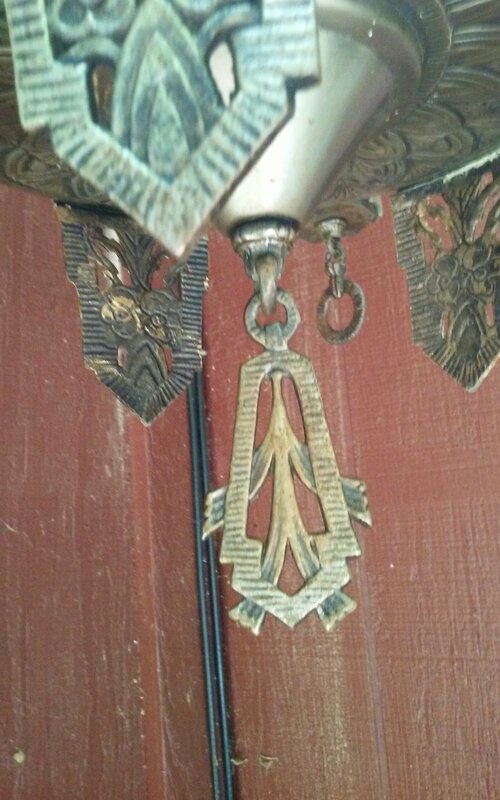 Have a Vintage/Antique/Oddity account to share? Leave a comment and share it! J.W. Holcomb the creator of vtgbox.com has been buying, selling, and collecting vintage and antique items for over 20 years and is one of the leading experts on finding, identifying, and appraising unique antique and vintage “smalls”. From old advertising items, oddities, paper antiquities, old postcards, old toys, comics, to railroad and occupational antiques, J.W. 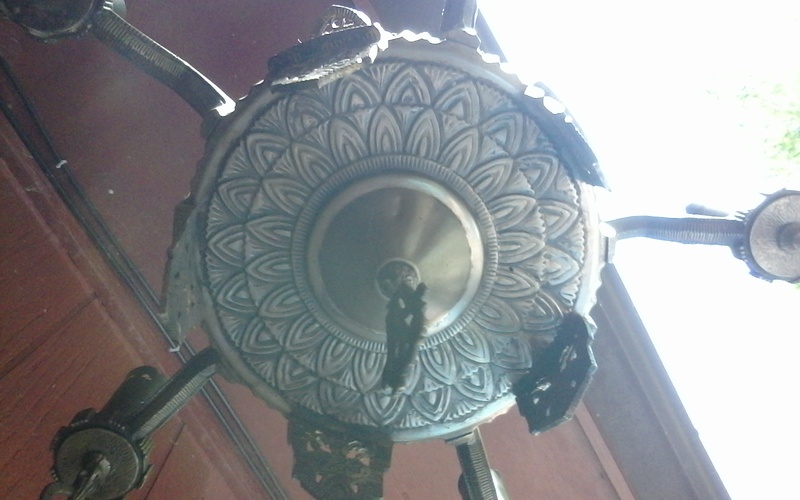 Holcomb has dealt with almost all types of vintage and antique items. Vintage Jewelry, Coins, Paper Antiquities, and Curiosities would be his favorite type of vintage treasure to unearth from the original source. Over the years the idea of having a monthly box of vintage items compiled and delivered to fellow enthusiast, collectors, and resellers has been something J.W. wanted to do. The new venture vtgbox is set to lunch in beta mode with a limited number of subscriptions available in July 2018. The new website describes the vtgbox.com as a curiously curated monthly box full of hand picked vintage items, trinkets, estate items, vintage treasures, antique goodies and more. 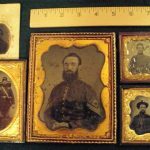 From antique photos, postcards, vintage jewelry, vintage toys, comics, railroad items, oddities, collectibles and more. 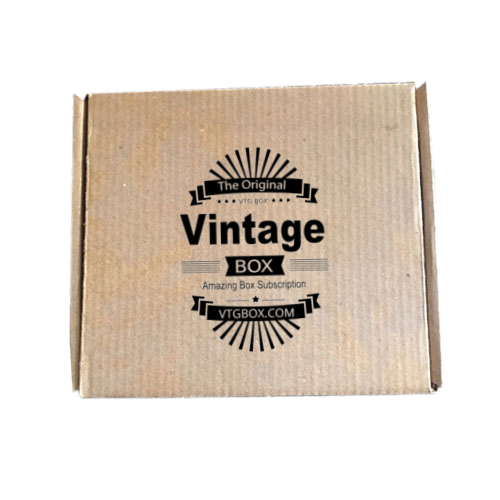 The VTGBOX promises to always be chock-full of vintage value and curiosity. These boxes are great for collectors, gifting, or resellers. All subscribers to the new monthly subscription service/product will receive their boxes the first week of each month. Each month members/subscribers of VTGBOX will receive an eclectic assortment of vintage goods and antique wonders delivered directly to their home or office. A small profile of each subscriber is collected in order to semi-customize the experience. For example a box recipient may want to share with VTGBOX that they collect coins, old toys, oddities, or like vintage jewelry. All boxes are hand arranged and packed by people who love vintage items themselves. One month you may get a box full of stuff you like and the next month you may get stuff you love. The service is designed to deliver curious fun and value. Each box will contain 10-15 vintage items and is guaranteed to be packed with monetary and entertainment value. 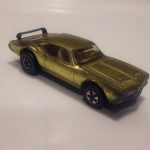 For many collectors getting their hands on the best of the best or the hardest to find item within their niche or category of what they collect is a must. 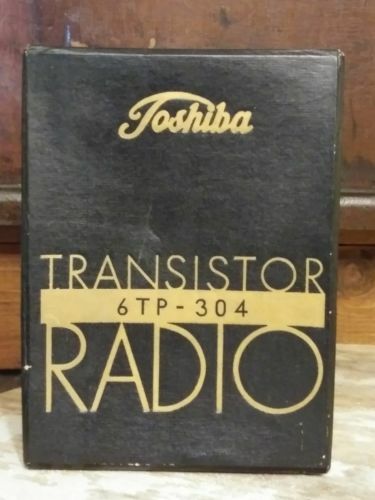 In the Vintage Transistor Radio or Pocket Radio world the Vintage Toshiba 6TP-304 Six 6 Transistor Radio known as the “Coffin” radio is one of the most hunted and highest value radios there is (Not The Most Valuable or #1 on the list but it’s on the top of the list). Other radios that have big price tags and resell value include the Sony TR63, Toshiba Lace Radios, Zenith Royal 500 “Owl”, ALLIGATOR MITCHELL OLD ANTIQUE REGENCY TR-1 TRANSISTOR RADIO, KR-6TS1 KOYO 6 Transistor radio – JAPAN, Toshiba 8 TP 90 Transistor Radio, all of the mentioned radios ca and do fetch $500 or more in certain markets like Ebay and online auctions. A global market is needed to fetch these prices! In a local market it will be hard to get this kind of money unless you hit the lottery and bump in to a diehard collector that needs one right away on impulse. Now back to the the Toshiba 6TP-304 Six 6 – This radio is HOT! and if you are lucky enough to find one in good shae and working at a yard sale or other sale that is priced cheap, BUY IT! You can expect it to sell for $500 and up. Condition matters but if the radio is beat up and is only a few bucks buy it anyway! The parts are very valuable also. Ebay is the market to sell these! Even the empty boxes can bring $100 or so (Like the one I found) – See pics below. The Toshiba 6TP-304 was manufactured in Japan in 1959, making it a mid-century modern (MCM) treasure for those that are in to MCM goods . Featuring an amazing art deco funky design that made other radio companies fire their designers and run for the drawing room! The team at Toshiba really surpassed all expectations when designing this radio. It is beautifully made and I believe it to be one of the best looking transistor radios ever made. This Toshiba (6TP-304 Six 6) has been nicknamed ‘The Coffin’ because of it’s unique almost coffin like shape. Apart from the unique and macabre cabinet shape this 6TP-304 also features a vertical under-painted slide rule tuning dial. The style of lettering used on the tuning dial is very uncommon for this time period and is another reason why this radio was way ahead of its time and the competition. The front of the cabinet is neatly divided into four visually pleasing sections partitioned by a gold band. There is a nice eye catching badge at the bottom right of the speaker grill. The 6TP-304 Six 6 measures just 4.3” H x 2.5” W.
In 1959 it had a sale price of $39.95 USD. Toshiba transistor radios were distributed in the USA by Transistor World Corp of New York. They were distributed in Canada by Regal International Corp of Montreal. In the USA Toshiba radios were sold by Jewelers who purchased them via Jewelers Circular Magazine. Do you have a 6TP-304 Six 6? Comment and tell us where you found it and what you paid for it! Feel free to add a link to photos. 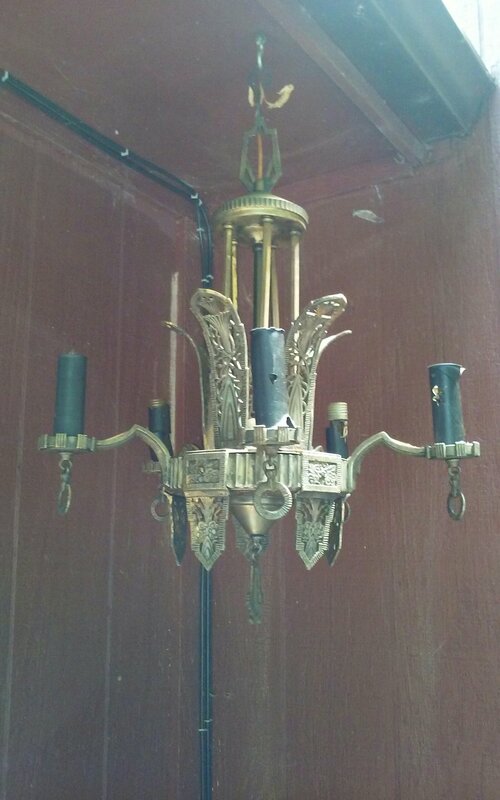 Do you have a home or estate full of older vintage and antique items? FACT: You do not need to have amazing clean pristine furniture, paintings, rugs, and high-end housewares to have a good estate sale! In fact it is quite the opposite! My most successful $$$ estates/sales/buyouts were far from the high-end look. From dusty-rusty tools, old paper items, old photos, boxes of trinkets, railroad “junk”, rusty signs, old toys, military items, and more! These type of eclectic mixed up multi-generational hoard houses bring in the most $$$ and the most interest from our buyers and our market. There are many options on how we sell your items for you (Broker) or we may even buy your house full and haul it off for an off-site sale. No matter what your need – Let us help you! We have the Human Vintage Encyclopedia (J.W. Holcomb and Friends) that will identify value where others do not. Knowledge is our best asset and find your best asset is our gift, with over 20 years of experience we know what sells and where to sell it and to whom to sell it to! 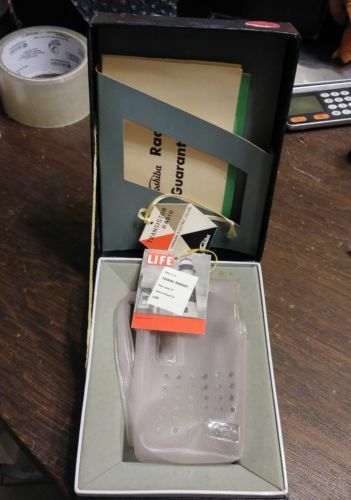 Here is a nice hard to find version of the 1950’s 10-2-4 Dr. Pepper Clock with mint green accents! This item was acquired from a private sale in Roanoke VA. Dr. Pepper items from this era are usually harder to find than Coca-Cola or Pepsi Soda items and can demand a higher premium that the other common sodas. 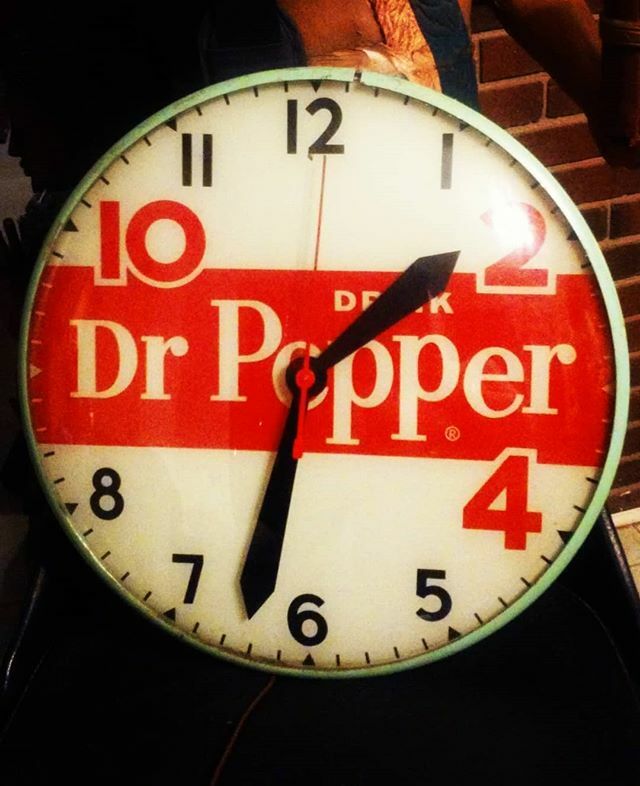 Certainly there are far more rare soda advertising clocks in existence, this is just a great example of a DR. PEPPER CLOCK. Commonly used in describing antique photos like Daguerreotypes, Ambrotypes and Tintypes – The “plate sizes” used in referring to antique daguerreotypes, ambrotypes, tintypes, and other photographs stem originally from the daguerreotype , for which the first plates manufactured were approximately 6.5 x 8.5 inches (16.5 x 21.5 cm) in size. Smaller size daguerreotypes were then defined in terms of how many plates of the smaller size could be cut from such a “full” or “whole” plate. These plate sizes became standardized and were subsequently used for the photographic formats which followed on the daguerreotype. 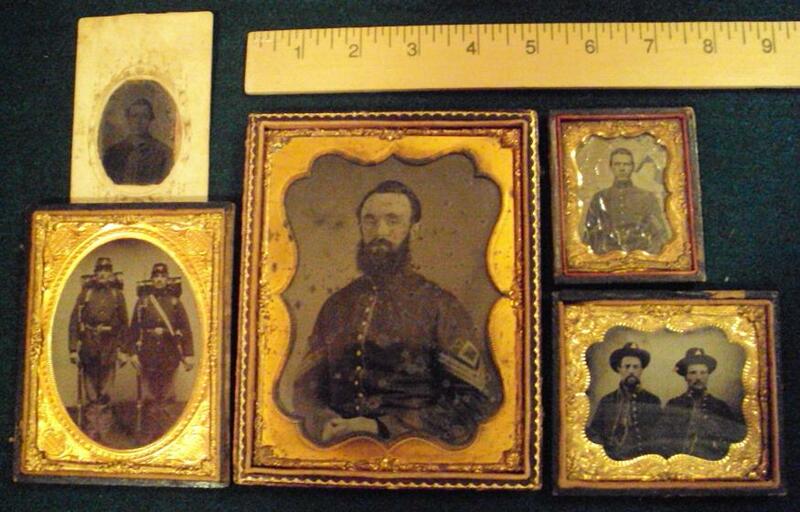 Plate sizes are still the standard method for referring to the dimensions of these 19th century antique pictures. FACT: The daguerreotype was the first commercially successful photographic process ( 1839-1860) in the history of photography. Named after the inventor, Louis Jacques Mandé Daguerre, each daguerreotype is a unique image on a silvered copper plate. The polished copper plate is treated with a chemical that reacts to make an image. 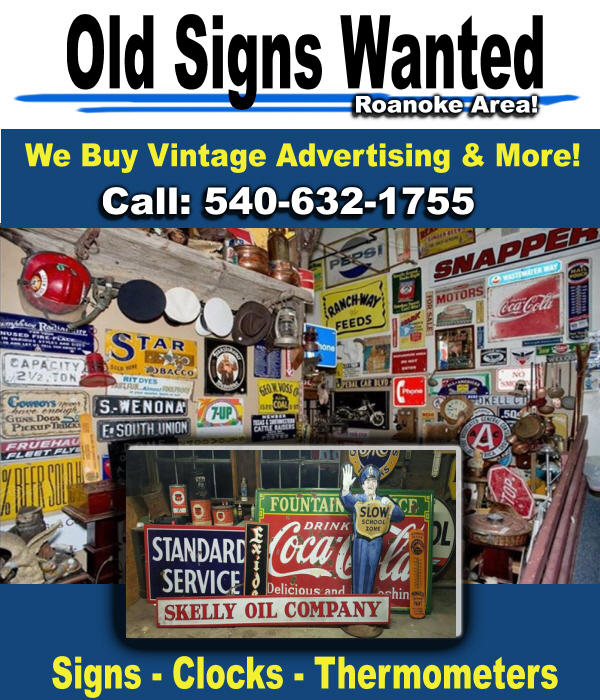 Do you have old metal signs, thermometers, coolers, or any interesting vintage advertising items in the Roanoke Area *100 Miles Radius??? We buy old advertising items and entire collections or estates full of old items. e buy all sorts of metal advertising signs and cardboard advertising. We only buy vintage signs typically from the 1970s or older. Older signs are in higher demand. Condition, age, subject, product and other factors play in to the price of signs. Never judge value off of age alone as you will be surprised and some times let don on the value – Just because a sign is old does not mean it is worth a lot of money. Let us know what you have for sale. We buy old items to resell and pay a fair price always. Brand: The brand a particular sign is advertising for is also an important component to value, many collectors will focus on one or two brands to build their collection around, so someone trying to get a sign for their brand that may seem otherwise unimportant can get increased value if there is a large group of collectors focused on that brand, this is part of the reason so many gas and oil signs sell for such high prices. Conversely, a brand that is not very well known or that doesn’t have much of a following will reduce the value of that sign since there just isn’t the same demand, all else being equal. Size: The size of porcelain signs is a big factor in value. The most valuable signs will be in the 30″-42″ range since that is a size that is fairly easy to display, but still has good eye appeal from distance. Larger signs tend to sell at a relative discount the bigger they get, since there is so much hassle in transporting and displaying them. Similarly, smaller signs also tend to sell at a discount simply because they don’t look as commanding on a wall. However, some niche areas such as porcelain door pushes or pump plates generate great value but still don’t have the high ceiling you see in the size “sweet spot”. This is just a general guideline of course, there are incredibly valuable signs at all sizes but this is a good guideline to pay attention to. Condition: As with all types of collectibles, condition is king. In some cases a sign in near-mint condition can bring ten times the value of the same sign as a grade 6 or 7. Additionally, condition increases the value at an almost exponential rate where the difference between a grade 8 and grade 9 is much larger than the difference between a grade 7 and grade 8. 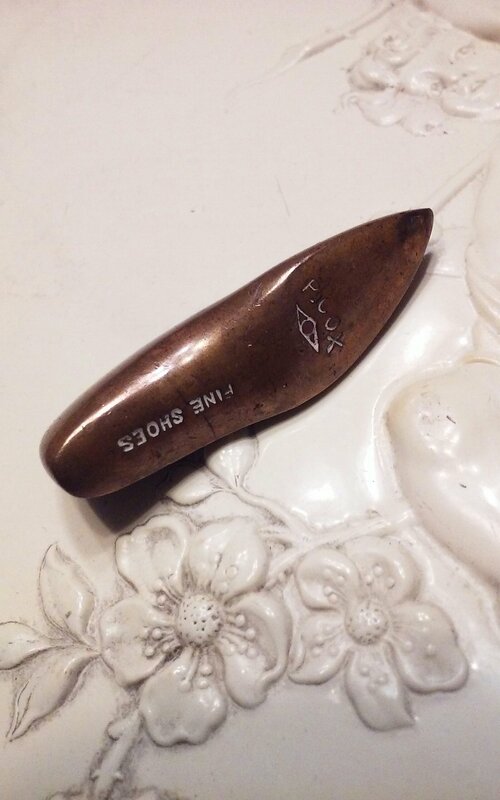 P. COX FINE SHOES BRASS MINIATURE SHOE ADVERTISING PROMO?